In retirement Rupert and Rene Musgrove moved to Wimborne minster in Dorset. 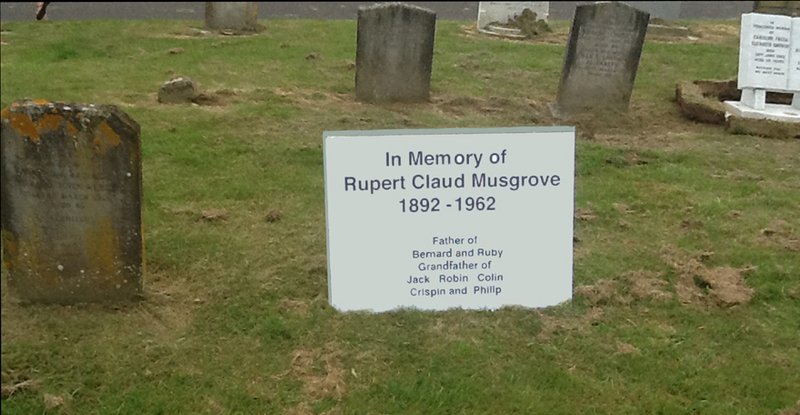 Rupert died aged 70 of cancer of the stomach at Christchurch hospital on Christmas eve 1962. 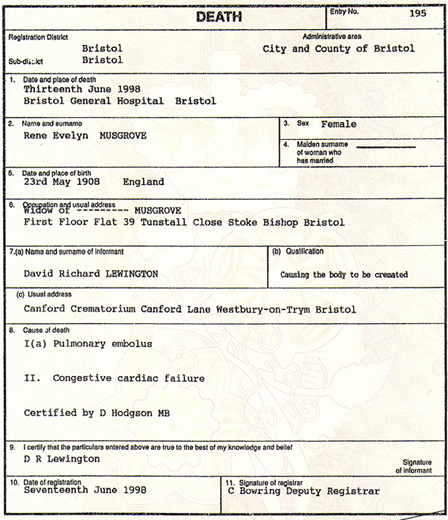 Shown below is the church Burial Register for Rupert, who is listed as Claude Rupert Musgrove. He was buried 4th January 1963 at St Micheal and All Angels Church Colehill near Wimborne Dorset. Rupert's second wife Rene lived on until 1998 dying at the age of ninety. in a council retirement flat in the district of Stoke Bishop on the outskirts of Bristol. When looking back on Rupert's life one should remember his insecure childhood. With his two sisters Daisy and Gracie dying when he was three (which must have been a terrible family upset) his sister Alice when he was four, and his mother Emily when he was six. If this wasn't bad enough both his father George and eldest brother George junior died when he was eight, and his closest brother Albert Roy died when he was twelve. His only surviving brother Herbert had joined the navy when Rupert was seven. In Rupert's short life he had lost seven close family members including both parents. Rupert was then to be brought up by his three sisters Emily, Lilly and Adelaide.